Waking up with a ‘bloodshot eye’ can sometimes be a sign that you’ve been pushing yourself a little too hard. If you start the day looking like a zombie, then it often seems to correlate with burning the candle at both ends, being very stressed or not getting enough sleep. It can be very tempting to just call the day a bust and give up. But what actually causes this and what can you do about it? Should you just turn around and go back to bed? And how can you get back the whites of your eyes a little more quickly? Broken blood vessels in the eyes are more accurately termed subconjunctival haemorrhages. The cause is actually not always known but it is often the result of ‘straining’ in some way. Examples include heavy lifting, vomiting, violent coughing and even sneezing. In other cases, it can occur as a result of direct trauma to the eye – whether that means you’ve been poked in the eye or whether it means you’ve rubbed your eyes too hard when they’ve been itchy. Other risk factors that make a broken blood vessel more likely include diabetes, high blood pressure, blood thinning medications and blood clotting disorders. Poorly managed blood pressure can also make a difference, as can having dry eyes. This is where the correlation with tiredness can come in and with burning the candle at both ends. Dry eyes can be a result of looking at a screen all night, or of dehydration. Meanwhile, we are more likely to see a dip in blood pressure as we become tireder. It then only takes a sneeze, cough or heavy lifting to cause the blood vessel to break. As mentioned though, the exact cause and nature of subconjunctival haemorrhage is not always known. Often you will simply look in the mirror to see that the bottom corner of your eye has filled with blood – and this often doesn’t come with any pain. 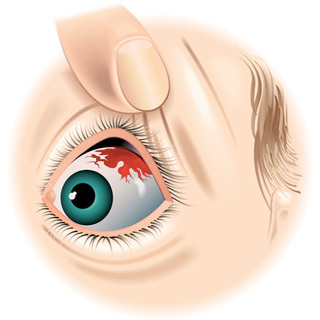 In the vast majority of cases, a broken blood vessel in the eye will go away on its own with time. Depending on the amount of blood, visible symptoms can take a few days to a few weeks to clear up. As there is normally no pain, you shouldn’t need any treatment in the meantime. If you do notice minor discomfort, then you may be offered eye drops by your doctor or ointment. In some cases, you may also have an infection which will need to be treated by antibiotics. If you find yourself suffering from this condition regularly however, then you might want to see a doctor or consider making lifestyle changes. Try to avoid medications such as aspirin that thin the blood, avoid rubbing your eyes and wear protective eyewear during sports. If you suffer from hay fever or other allergies, then try to avoid triggers that cause your eyes to become irritated. Know your limits at the gym and try to avoid straining hard for long periods of time. Make sure to take regular breaks, keep blinking and stay properly hydrated.